Yellowstone National Park’s Steamboat Geyser just erupted for the third time in two months, and scientists aren’t sure why. It doesn’t erupt very often, but when it does, it is the tallest active geyser in the world. The Steamboat Geyser — known to eject a column of water 300 feet in the air — erupted for the third time April 27. Based on seismicity data, these recent eruptions have been a little bit smaller than in the past. Even if these latest eruptions are smaller, they are still impressive compared with, say, Old Faithful. The April Steamboat eruptions discharged about 200 to 400 cubic meters of water each, about 10 times the amount of water released by an Old Faithful eruption. The problem is that Steamboat lacks the faithfulness. This geyser is in an area of the park called the Norris Geyser Basin, known to be the hottest and most changeable thermal area in Yellowstone. Before March 15, the last time this geyser spewed was in September 2014. 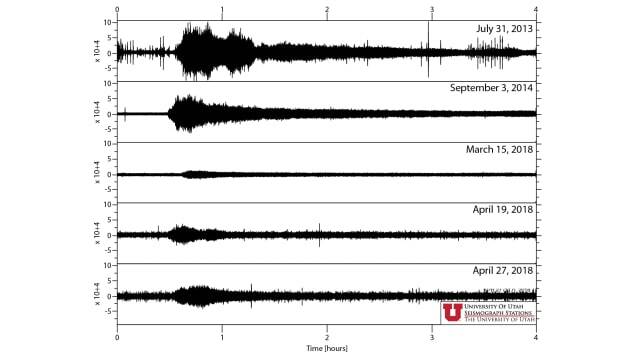 The day of the first eruption, park staff detected activity on nearby seismometers, thermal gauges and water discharge on a US Geological Survey stream gauge. Yellowstone National Park staff arrived in time to observe steam from the geyser but no water column. According to the Geological Survey, this is a usual occurrence after a vigorous water eruption. The steam phase can last several hours. Not one person is known to have witnessed the initial water column from these three eruptions. This time of year, the Norris Geyser Basin is closed to tourists until the snow melts and winter damage to trails can be repaired. If it wasn’t for sensors near the eruption site — and the rocks and mud strewn about that were ejected by the geyser — there it would be little confirmation. Scientist missed the second eruption by only minutes. 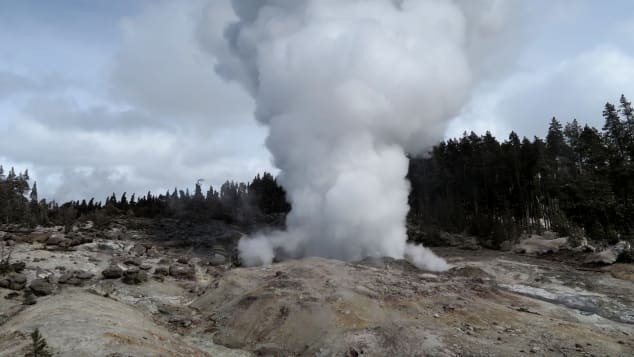 A team of Yellowstone National Park Geologists was in the area for the April 19 eruption, but the geyser became active only 15 minutes after they’d left the site. The activity of the third eruption was observed from a driver passing through the area. Once the trails are clear, guests will be able to hike out to the geyser. Scientists aren’t sure whether the new activity is due to a new thermal disturbance or whether the geyser is merely entering a period of more frequent eruptions, as in the 1980s, when numerous eruptions from the geyser were separated by weeks or even days. Multiple eruptions also occurred in 2003. Or, the USGS notes, “the current eruptions may simply reflect the randomness of geysers.” It could be years until it erupts again.